After coaching stops at USU, Wisconsin and Oregon State, Andersen has returned to his alma mater. (Rick Egan | The Salt Lake Tribune) Utah associate head coach/defensive line coach Gary Andersen, during the first day of Spring practice, Monday, March 5, 2018. Gary Andersen glanced back to see who was trailing him up the ramp from the Eccles Football Complex toward the weight room. He heard the cleats clacking against the pavement. It was one of his guys. Rushing to catch up with his new coach was 6-foot-5, 317-pound defensive tackle Leki Fotu. Andersen slowed his pace, Fotu eventually pulled even and said something to his new position coach. And what does a guy who just walked away from $12 million and a coaching job in the Pac-12 do? When he left his alma mater nearly 10 years ago, chasing life as a coach in college football, many wondered not if but when he’d eventually circle home to Salt Lake City. The path has been circuitous and turbulent, but Andersen is back on a football field, back in those comfortable colors and trademark visor, and back at Utah. And from the looks of things, he’s back to enjoying himself and being himself. The move was announced in January, but this is Andersen’s first real week back on the job. He was named Utah’s associate head coach and will coach the defensive line with Lewis Powell, who Andersen also happened to coach during Powell’s playing days with the Utes. When the NCAA approved a spot for a 10th full-time position starting in 2018, it seemed predestined that he’d return to join close friend and coach Kyle Whittingham. It soon became reality giving Andersen a much needed next phase of not only football but also life. It’s a familiar one, sure, but it’s been six months between the time he stunned the college football world by walking away from Oregon State and roughly $12 million. He kept such a low profile in the months after that he was spotted here or there at Utah State football practices in Logan then exiting before media members were allowed in. One of his former staffers in Corvallis, Ore., told The Oregonian in the wake of Andersen’s shocking exit last October that he is “the most unique man in college football.” Who leaves that much guaranteed money on the table? Who leaves a coveted job? We know the answer: Gary Andersen does. There was a disconnect between him and his coaching staff, the strides he’d envisioned the Beavers making in Year 3 never materialized, and he eventually called it himself. Andersen’s yearly salary at OSU was $2.65 million according to USA Today, more than Oklahoma’s Lincoln Riley, who led the Sooners to the College Football Playoff, and more than former Central Florida coach Scott Frost, who led UCF to an undefeated campaign last season. His sacrifice eventually allowed the Beavers to go out and start anew once the season ended, putting behind Andersen and his 7-23 record in Corvallis. It has created an opportunity for Andersen and the Utes, too. He was in the end zone of one of Utah’s practice fields this week, avoiding the mounds of fresh late winter snow, dropping his shoulder to imitate cleaner moves off the line, slowing down things for his new pupils on the defensive front. During his first media availability back in Utah’s crimson and black colors, Andersen said he’s refreshed with his new role, that he can be comfortable sitting in a film room for hours on end meticulously watching technique instead of worrying about oversight of a program. “A lot less distractions,” he said, smiling. That hallmark enthusiasm Andersen is known for is vibing with the Utes. Sophomore defensive tackle Pita Tonga, who went to nearby Highland High, remembers being recruited by Andersen when he was coaching the Badgers. Tonga said Andersen is the same now as he was when he was trying to convince the massive homegrown lineman to make the move to Madison years ago. Andersen made it a point several times throughout his first interview session with the local media to note that he’s motivated to be back at a program that prioritizes the student athletes first and foremost. At Wisconsin, he was frustrated that he couldn’t get student-athletes he felt were fits and deserved to be part of the program in due to admission standards. There’s always an adjustment period, even if you establish home base in your hometown. Andersen said his wife, Stacey, has the house she wants, their dogs are enjoying life back in Utah and their three boys are grown now. He had to wait, however, to see how long it’d take for his players to drop their guard and let him in. Relationships, Andersen explained, are built over time. It’s not what you say or how loud your bark is, it’s what you do through action. Turns out, the transition was easy. It’s still football and he’s still Gary Andersen, the man with the visor and the hoarse voice. “He seems a lot more relaxed and he seems pretty content,” McBride said. The acclimation process, Whittingham says, was “seamless.” It’s almost as if he never left. 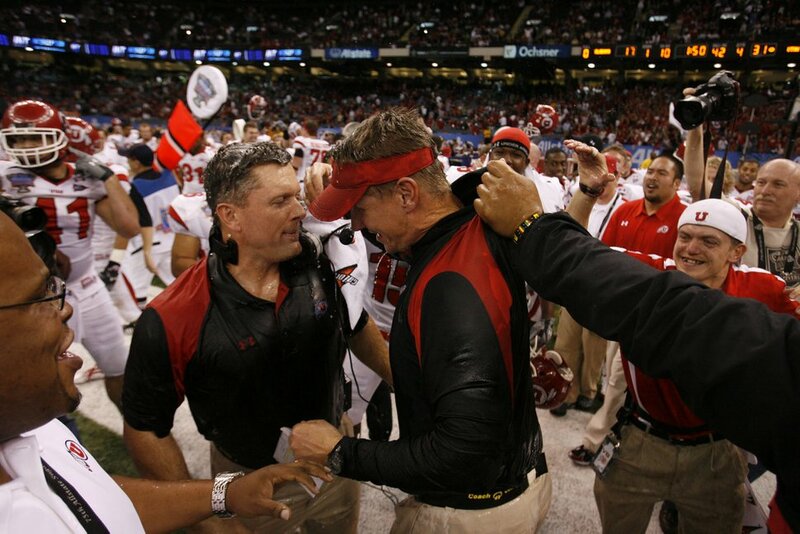 Scott Sommerdorf | The Salt Lake Tribune Utah head coach Kyle Whittingham and defensive coordinator Gary Andersen celebrate after the Utes defeated Alabama in the 75th annual Sugar Bowl in New Orleans, Friday, January 2, 2009.